This is the 4th quarter 2018 Net Lease report. 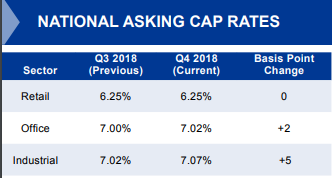 It is a national report that covers national cap rates by quarter and property type, number of properties on the market, median national asking vs closed cap rate spread, selected single tenant sales comparables, net lease cap rate trends, median asking cap rates by year built and the results of The Boulder Group cap rate poll! In other words, if you are involved in net lease deals you will want to read this report. In fact, you should follow The Boulder Group and check out their amazing research overall. They do an incredible job of tracking the national net lease industry.